Amazon is turning up the volume in the music business. The world’s largest online retailer will mount the first national U.S. TV campaign for its music-streaming service, featuring ads with songs from Ariana Grande, Kendrick Lamar and Queen. They’re part of a larger effort that will extend to billboards, online video and radio, and to three countries -- the U.S., U.K. and Germany. Music has ascended the priority list at Amazon.com Inc. because of the popularity of the company’s Echo speakers and the virtual assistant Alexa. Music is one of the most common requests of Alexa, and listening hours have doubled over the past year, the company said. The music service has helped Amazon (AMZN.O) differentiate Echo and Alexa from the competition, Steve Boom, the head of Amazon Music, said in an interview. Selling smart speakers is the latest battleground between technology giants Apple Inc. (AAPL.O), Amazon and Alphabet Inc.’s Google (GOOGL.O), all of which operate music services. Amazon provides few metrics to substantiate the growing popularity of its music offerings and won’t say how much it plans to spend on the current promotion. But the Seattle-based company says tens of millions of people use its two music services. Amazon Music comes included in a membership to Amazon Prime and offers a library of 2 million songs with limited new releases. 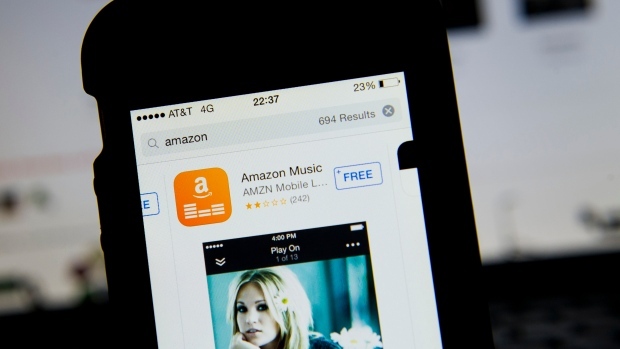 Amazon Music Unlimited has tens of millions of songs and charges a monthly fee. The company says it’s targeting a different consumer than Apple or Spotify Technology SA. The average Amazon shopper is a little older and less focused on hip-hop and R&B. Amazon users are just as likely to crave jazz, country or music for their kids. The California rock duo Best Coast recorded a kids’ album solely for Amazon, while August Greene, a trio including jazz pianist Robert Glasper, released an album exclusively on the service. In many industries, the mere threat of Amazon sends stock prices tumbling. The company is the second-most-valuable in the world, behind Apple. It’s also a major supplier of cloud services, and a growing threat in everything from groceries to movies to health care. But in this case, Amazon is playing catch-up. Though Amazon is a major online retailer of music, it’s a small player in streaming relative to the two market leaders, Spotify and Apple. Spotify has persuaded more than 80 million people to pay for its service, boosting its value to about US$35 billion. Apple, once dominant with iTunes, has established itself as No. 2. The growth of those paid services has boosted music industry sales for three years, providing a big dividend to the recording industry. Labels are now looking to Amazon, as well as YouTube and Pandora Media Inc., to counter Apple and Spotify. If new players can sign enough customers, the two leaders will lose leverage in rights negotiations. YouTube, owned by Google, introduced a paid music service in May and is planning a months-long marketing campaign that begins in the fall. Pandora, still primarily a free online radio service, has struck deals with major phone providers to offer its paid subscriptions for free to new users. All of these services offer millions of on-demand songs and customized playlists. Yet Amazon says it will stand apart because its service is tailored for people listening on a speaker rather than on earbuds. Users can just ask Alexa to add a song to a playlist or request a song they haven’t heard for a while. Major record labels are letting Amazon offer a lower-priced, speaker-only version of the service at US$3.99 a month. Competitors are US$9.99.